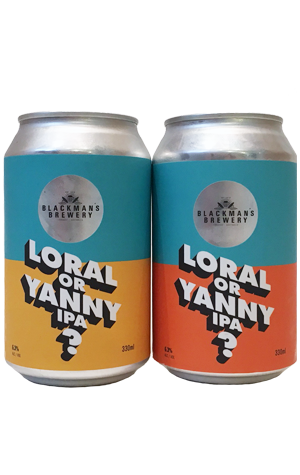 Beer Blackman's Brewery Loral Or Yanny IPA? Way to interfere in a Saturday evening gathering, Blackman's Brewery... No sooner had the twin cans of Loran Or Yanny? hit the surface in the kitchen before the host is playing the Yanny or Laurel clip on his phone, his speakers and jamming headphones onto people's heads. Which, presumably, means the Torquay brewers have hit onto something with their latest pair of IPAs. The concept, inspired by the fact there's a hop called Loral, is to provide a bit of education for drinkers while garnering a marketing boost from the internet sensation (is that what these things are called?). So, using the same base beer – a West Coast style IPA featuring Loral, a variety that combines a New World fruitiness upfront with a more Old School spiciness underneath – they split the batch, dry-hopping one half with newer, tropically fruity US hops and the other half with classic US hops of a more floral, spicy nature. Then you have to work out which is which. It's like self-driven blind tasting, forcing you to put the olfactory system to work more than you might normally. The three of us splitting the cans agreed on which we thought was which; one has a more tropical, candied fruit aroma – bubblegum or Lilt soft drink like – and is perceived as sweeter. There's less difference to taste, with both beers pretty bitter, while even the spicier of the two has some pithy grapefruit thing going on. So, which is which? Well, that's for you to decide. As for Yanny or Laurel, the women were almost all in the Laurel camp, Crafty Pot Jr growled out a "LAUREL!" as soon as he heard it, while dad was in the Yanny or Yeery camp, with a hint of bassy Laurel. Well, that and the orange can.